This house was near where the murders took place, and is mentioned in one of the articles below. A Mother and her Five Children Murdered!! 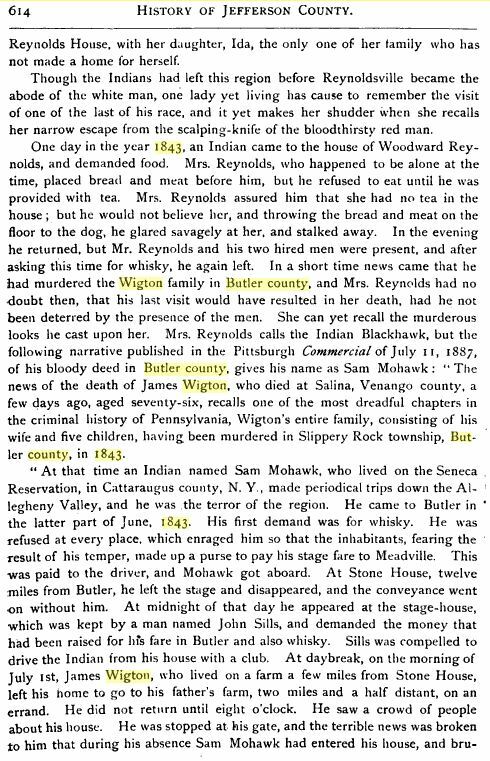 A most shocking and brutal murder was committed in Slipperyrock township, this county, on this morning, by an Indiam calling himself Samuel Mohawk. We have been enabled to gather the following particulars of the horrid tragedy. Mr. James Wigton had left his house early in the morning for the purpose of going to his father’s to borrow from him a horse to plough corn, leaving his wife and five children at home. While he was absent, the Indian came there, and as appears from his confession, murdered Mrs. Wigton and her five children by beating out their brains with stones. Mrs. Wigton and the youngest child were not quite dead, when first discovered. The Indian then proceeded to a Mr. Kennedy’s house, and made an attack on him and his family — injuring a son of Mr. Kennedy very severely, perhaps dangerously, by hitting him on the head with a large stone. After being driven off by Mr. Kennedy, he next went to Mr. Kiester’s, where he was captured, after a desperate resistance, in which a man named Blair was seriously injured. He was taken to Wigton’s and confessed the murder, and said he way sorry for it. An Inquest was held on the dead bodies, and the jury returned a verdict that the murdered persons came to their deaths by the hands of Samuel Mohawk. Mrs. Wigton was about thirty-five years of age — the children, three girls, and two boys, were aged about eleven, nine, five, three, and one, years. The Indian is now in jail, and will be tried at the September Sessions. We understand that he lives in Cattaraugus county, N.Y. This unfortunate wretch remained in this place for a day or two previous to the commission of the above horrid deed, and complained of being sick. THE ruins of the Butler county Court house call up many interesting reminiscences says the Oil City Blizzard; But one murder received the death sentence in the old building. It was in 1869, I believe that a young farmer named Hockenberry, living on Muddy creek, asked the hand of Minnie McCandless, the daughter of a neighboring farmer. She refused him and he was so grieved and disappointed that he had determined to kill her. One bleak, dismal night in the late fall, he crept up to the old farm house and peering through the window, saw the rosy cheeked girl sitting by a cheerful fire. His pistol aim was deadly and the poor creature fell over dead, while the blood slowly oozed from the wound in her head. The trial of the young farmer lasted several days, and Judge McGuffin pronounced the sentence which was soon after executed in the county jail yard. This lead back to the only other execution in the county, in 1843, Mohawk, a raftman, was returning from Pittsburgh to Orlean, N.Y. He was drunk when he left the stage about 12 miles below here, and the tavern keeper refused to keep him over night. The drunken and enraged red man sought the house of James Wigton. 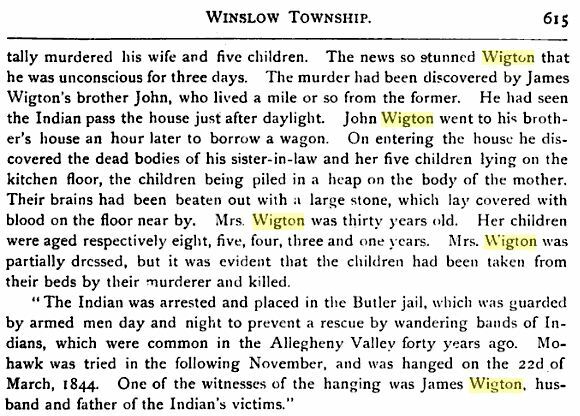 Wigton was absent and the Indian wreaked his vengeance against the white people by murdering Mrs. Wigton and five children. The butchery was brutal, almost beyond savagery. The neighbors gave chase to Mohawk, and with great difficulty made him prisoner. His trial caused much interest and excitement at the time as old newspapers show; He was the first person executed in the county. The 1843 murder of a mother and her five children — reportedly the last Indian massacre in Pennsylvania — was described last night at a meeting of the Venango County Historical Society. Lloyd Bromley of Seneca, retired Venango Campus professor and a close student of Indian history in this area, used the Old Stone House as the theme of his talk in the Franklin Library. HE TOLD of the Wigton Massacre of 1843 near the Stone House, historical event which he has researched in detail. In that massacre Mrs. James Wigton and her five children were slain by Samuel Mohawk, a Seneca Indian from Cataragus County, N.Y., on Saturday, June 30, 1843. Bromley said Mohawk arrived in Butler from Pittsburgh after he had helped bring a raft of logs to Pittsburg from the Upper Alleghney. After a brief stay in Butler, Sam took the stage for the interchange at Stone House Tavern. In the evening he wound up in a fight with the proprietor, John Sill. Sill broke a chair over Sam’s head and shoulders and put him out of the tavern. The next day Mohawk wandered back up the road, a mile north of Stone House, and entered the grounds of the Wigton home. “Just what prompted the struggle we are at a loss to know,” Bromley said. “Crazed with white man’s liquor, having lost his sense of moral values, abused and beaten, he attacked Mrs. Wigton as she defended herself and her brood. “Leaving her lying there in the yard, he entered the home to complete his infamous work. Finding the baby in the kitchen cradle was not a girl, he bashed its brains out. “Searching around he found a stone in the washhouse fireplace used there in place of an iron. He took it and went upstairs to the bedroom where the other four children were sleeping and beat their brains out. A neighbor’s son found Mrs. Wigton in a pool of blood in the kitchen. Her face was badly beaten and one hand almost severed. The boy called his parents and the tragic news quickly spread about the community. “The room was found covered with blood,” he said. James Wigton returned from his father’s farm where he had borrowed a horse and was stunned by the tragedy. He never entered the house again. THE MOTHER and five children were buried in a common grave July 2, 1843, in the cemetery of Muddy Creek Presbyterian Church, three miles south of Stone House and about 1,000 feet off Route 8. To date the grave is unmarked, Bromley said. An estimated 6,000 people attended the funeral. Later Charles McQuiston, brother of Mrs. Wigton, Tom Donahy and others cornered Mohawk in the home of Paul Keister. He was beaten into unconsciousness and dragged outside. After he was revived, Mohawk was taken to the Wigton home where he confessed and rehearsed the crime in part but he later said they could not prove he committed the murders. James Wigton and his brother William drew guns and stepped forward to shoot Sam. After a plea for law and justice, a coroner’s jury of six men head a hearing under an apple tree on Wigton Farm. Mohawk then was taken to Butler in a covered wagon. Later a grand jury returned a true bill. While in jail, Mohawk was baptized into the Christian faith. “Upon coming to his sober senses, he had sought God’s forgiveness,” Bromley said. His trial began December 13, 1843, and after four days and 48 witnesses had testified in four days the jury in one hour handed down the first death penalty in the history of Butler County. SHORTLY BEFORE his death, two Seneca Indians came from Cataragus with a burial suite and moccasins and begged that Sam be shot instead of hung. Mohawk was laid to rest in the woods on Hill Street. James Wigton received a letter signed by six Seneca chiefs saying they did not condone Mohawk’s offenses and actions and they implored him to intercede for safe conduct for Indians passing through this area. They had to return home by the Venango Trail from Pittsburgh and Cincinnati to the upper reaches of the Allegheny. Bromley said that for a long time Indians were not welcome in this area. UPDATE: I just ran across an old New York Times article about this murder, which can be found HERE. ( It’s a PDF.) It gives a good summary of the case. This entry was posted on February 23, 2009 at 2:04 am and is filed under Bloody Murder Monday, Crime, Deadly Consequences, Native Americans. You can follow any responses to this entry through the RSS 2.0 feed. You can leave a response, or trackback from your own site. Thanks for posting this. The victims were ancestors of mine on my grandfather’s side. I did a report on this in grade school. I appreciate it not being lost. They are buried at the Muddy Creek Cemetery. Thank you for the additional information! It was a horrific tragedy and I am glad to learn that they are buried and not forgotten. I mis-stated that. James Wigton is my ancestor, not the victims. Great, great grandfather, I think, I would presume from James’ later remarriage. 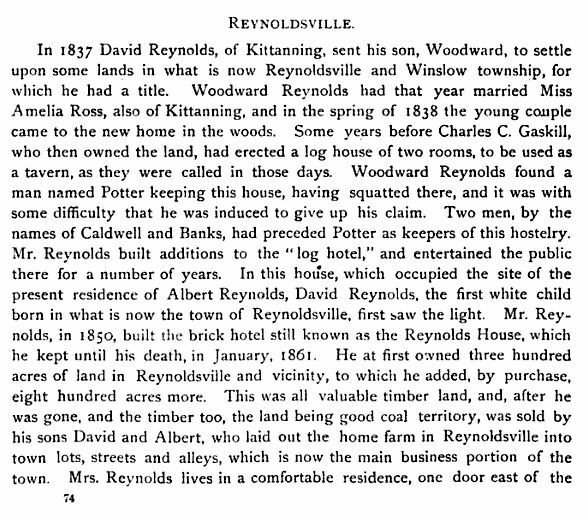 The best information I had about the event was from a book of Butler County History that my grandmother had. Having not done a true genealogy survey, I had thought for all these years that perhaps the infant survived, and that was where our lineage derived from. Apparently not so. I say presumably from James’ second marriage, because my great grandfather was also named Perry Wigton and obviously did not die at age 3. I’m trying to get clarification from my mother. She hasn’t answered me yet. I don’t recall the name John Perry, just Perry. My grandfather was Harry Wigton, also of Butler. He had a sister named Elizabeth, a school teacher in Butler, who married Bob Jamison. You didn’t give a time frame for your grandfather, but I did find a Harry E. Wigton, born about 1909 with a sister, Elizabeth, born about 1908, living in Clay, Butler Co., PA in 1910. Parents were Charles C. Wigton and Pauline J. Bollinger. Charles’ parents were John Henry Wigton and Elizabeth Thompson. If these sound like a possibility, you might ask your mother if the names ring a bell. These Wigton’s are related to the ones in this story, although not a direct line from the father James Wigton. They descend from his brother John, I think. Ok seems I had my great grandfathers mixed up. Steven Perry was my gramma’s father. Charles Wigton was my grampa’s father. At least there was a Perry in there somewhere, lol. You’d think I would know better. I named my eldest son Adam Steven for Steven Perry at my mom’s request. Thank you for posting this. I am also a descendant on my grandmother’s side. Her maiden name was Ethel Wigton. I wonder if Ethel Wigton was a cousin of my grampa? Ethel WIgton was my aunt. When I was very little we used to visit a lady who was related somehow, I called her “Aunt Pearl”. She was a very sweet old lady. But I have no idea what her relation was to the family. What would be the motive? Why was it important to mention the killer was Native American? Most likely this man killed his wife and children himself and then pointed at some poor Native man to take the blame. Scalping knife of a blood thirsty Redman? Crazed off white man’s liquor? Come on people. This is about as believable as Casey Anthony blaming an illegal immigrant babysitter of kidnapping and killing her daughter. This happened in 1843. Times were much different then. And yes, the Natives did do this sort of thing often. It’s history, Tony, good grief, not Casey Anthony. Get a life. Or are you going to call Nancy Grace so she can shriek about it? James Wigton was my great grandfather. Bonita, I am Erma Wigton’s great-granddaughter. Who is your mother? Very sombering story. My family had just learned of the tragedy thru some geneaology my grandfather had done years ago. We are related thru the McQuiston side. my name is crystal hale, i am the great- granddaughter of floyd walter wigton. i have been doing the family history since my grandmother doris ellen wigton passed away. i have records of the wigton side dating back to 1698 with john wigton. i am looking for photos and records to add to my work. i would be more that happy to share my information with you for more information on my family. thank you for your help. I am a great-grandaughter of Erma Wigton and would be very interested in any information you could provide into our family history. I believe that Sam Mohawk committed the murders but for this article to keep saying “A Native American” or “The Native American” is a little rude. First off, this man had a name. Second, he was NOT given a trial. This man was cornered then hung when asked do you want to be shot or hung. He asked to be shot after he admitted to the crime. Instead they did the very thing they were planning on, which was to hang him. My last point is really a request. I realize that you all probably didn’t write the articles but if you all are going to write anything about this could you at least use his name. He wasn’t a dog or pet. At least spare the rest of us Native American people and use his name. I am Native American and when I see these article and read them it makes me feel like those people are pointing fingers to the whole Native American population even if we are not from the Seneca Nation. I mean all of this in respect to all of the Wigton family and I don’t mean to tarnish the Wigton name. But I want people to remember that back in that time Native people were not treated fairly and that many of these people did not get a trial and the ones that did it obviously didn’t do them any good. Charlotte, I didn’t write ANY of the articles; I just transcribed or posted the actual image of the writing. It is not for me to be politically correct. I am posting these stories as they were written at the time, like a historical document, if you will. No where in the article is he referred to as a “Native American”. If he was I would seriously question the historical authenticity of the article. Throughout the article he is referred to by his name, and as a Seneca Indian. He murdered children, and he never even denied doing it. I believe he was treated approximately as fairly by the community as he treated that family. And that has nothing to do with race. I didn’t even bother to go back and look because these types of comments usually seem to be knee-jerk reactions by those who would like to revise history to suit them. You’re welcome. I appreciate your efforts to preserve the actual historical content. It’s really a shame that the ones who launch these assaults on the original facts, don’t realize how the accuracy of the rendering could actually help them in the long run. Nobody can change what happened to Sam Mohawk or the Wigton family, and revising the facts of history will not help them. But civil rights were strengthened by events such as these. If they revise history to make it all fluffy soft, then there shall be nothing to point to, moving forward, that needs changing. Exactly, well said. Thanks again for taking the time to respond. Excuse me “The Indian” You cannot tell me that throughout this article he was called “Sam” or “Mohawk” You can go back up and read. I love history, really I do but it ticks me off to no end when I read something like this. Have either of you been to a reservation? Have any of you seen or heard of how Native people are treated? Your comments tell me you haven’t. Civil Rights hasn’t done very much at all if you ask me. How is “accuracy” doing any good? Look at what you were probably taught in kindergarten.. Did Columbus discover America? No, people were living here when he got here. So if you want to get on to people for revising history and the facts go to them. Im just giving you what I was taught. And if you can’t handle the “assaults” on stuff like this then don’t read them. I was just putting out there what I have been told and what I think just as you have. So what you were told is more accurate? Or just what the revisers want you to believe? Many of these people “passing down history” don’t even know the real history, but they do have an agenda. Not that it matters, but my husband is Native American, and worse yet, his tribe was never even allotted reservation land. But that doesn’t change facts. There are endless accounts of whites being ruthlessly murdered by natives. You can’t pretend that didn’t happen anymore than we can pretend the whites didn’t swindle the Indians out of their land. However, this was not unique to America; it has happened, and continues to happen around the world. People are conquered; it is part of life. If you want to pretend YOU were a victim of this, that is your choice, but you were not alive then, and more than likely have not suffered at the hands of the evil white people. And I don’t pretend that many of the tribes that I am part of in the past hasn’t murdered colonies of Native people. But to see countless articles of Natives being the source of murders, other crimes, and even hauntings. Native people fought for they’re homeland and some were given land in poor condition or no land whatsoever. Native people are still victims no matter what YOU may think. And I have the feeling that you think I’m being childish but sadly I am a child. I am in high school. And for your information I have been pushed out of something as simple as girl scouts for my native blood. I want you to go and take a trip to a rez of the Lakota people and see the shape we were left in. Then I want you to say that MY PEOPLE weren’t and aren’t victimized. And I’m not speaking on just my behalf. I was asked to do this by my Grand parents. Yes people are conquered but why did american’s deny people the rights that the white people themselves fought for themselves. You’d think they would know the situation better than ever. I did read it. I see numerous references to “Sam Mohawk” and “Seneca Indian”. It was “my” family that was murdered in the fashion written by history, and I don’t harbor any malice toward Native Americans, American Indians of any tribe, or even Sam Mohawk, himself. On the other hand, neither do I feel “indebted” to current living Native Americans or any other race that somehow wishes to hold me personally responsible for the “inequitable” actions of my racial predecessors. Because…(simple reasoning) I didn’t do it. Not sure who this poster is trying to convince, or of what, exactly, in any case. Failing entirely to see what any of this has to do with Christopher Columbus, or how that in anyway pleads any valid argument for any point that could possibly be made here. It may or may not have happened exactly as stated in these articles, but that does not negate the historical relevancy of the record as it exists. If you want to write a different story about this event, please DO share any sources that tell it differently when you conduct your research. I already have. I never said you people were indebted to mine and I wrote the Columbus part to prove that I’m not “revising” history. Our government has. READ! I never said you committed the deeds that were done. All I asked is that if you were going to post YOUR version of this tragic event is that you at least consider the feelings of my people. Just as you said “…I don’t harbor any malice toward Native Americans of any other race…” My people don’t either. We just ask that you try to understand our point of view during that time and try to kinda get readers to understand the Native Americans view. Im not saying completely ditch the sadness the your ancestors felt but please don’t leave my people in the spot that we are trying to defend ourselves from accusations and stereotypes. Believe it or not there have been many of times when my sister or grandmother was confronted about this very case just because we were of Native blood and we are Lakota not any part of the Seneca Nation. So you are the one blowing my first comment out of proportion. Well it is entirely pointless to attempt to have a conversation with anyone who clearly engages in selective reading. This is a collection of documents as THEY were actually written. I see nothing to “understand” about anyone’s view of the circumstances as they are presented here. His point of view “during that time” is that HE (not you, not your grandparents, not the entire Lakota tribe) was drunk off HIS rocker, and apparently HE was a mean drunk. Then as now, business owners typically “reserve the right to refuse service to anyone”. So if you are going to go in there drunk and cut up, you are going to get tossed out on your tush and it doesn’t matter WHO you are or WHO your people are, or how badly done to your ancestors were. I don’t know why you feel the need to defend yourself from the accusation of a murder that YOU clearly did not commit. Nobody here, and in fact, not even the original authors of these documents, pointed a finger at you or your parents or grandparents. This is NOT the correct forum for your argument, whatever it is, although your previous comment sounds very much like it is being served with heaping helpings of self pity with a large helping of entitlement for desert. If you feel that you are somehow being discriminated against in the present tense in your own community, there are actual avenues you can pursue with regard to such actions. This is not the correct venue. If the Native Americans are still victims, it is by their own device. They choose to live where they do, work or not work, drink or not drink, learn or not learn. Nobody is making these choices for them. Don’t be a victim of your own choosing. Be the change, as they say. Thanks for the link to the court trial! You are welcome! It is an “interesting” read. I’m related to the family, James being my ancestor. It is very sad what happened, however, if it didn’t, I would not exist, and neither would my family. I have researched my family history, and surprisingly I never knew what had happened to my four-times great grandfather or his first family. You people need to do your due diligence. This is well documented and us Wigtons that have done the research have all the paperwork. Always some jackass out there that wants to dispute facts or start a nasty discussion. It’s all online now folks so read it yourself before giving an uninformed opinion. You can also go to Muddy Creek Cemetery and see not only the tombstone but a memorial marker as well. The Butler County, Pa. Library is a treasure trove of information. I have spent about 35 years researching my family and all the info I have is backed up, not my opinion. What a terrible tragedy. I lived in the Slippery Rock area for 5 years while going to college. I lived not more than 2 miles from The Stone House on Rte 173. I somehow caught this thread as I researched the story for my own interest. The man was obviously mad, committed the heinous acts and was brought to trial and was fairly tried. It was also recorded in the New York Times and was also mentioned that the Seneca Indian tribal leaders came to the trial and asked that this horrible tragedy not be a scar on the people’s od the Seneca tribe, asking if the local government give fair treatment for any Seneca Indian who may pass through the area. In my opinion, it seems as if the journalists of the time collected relevant facts and provided opinions and views of those on both sides of the story. I think that we as Americans (because we are all Americans) need to calm down and be a little more tolerant of one another. Never has the world been perfect, and we as people need to just relax and not point blame or create hatred because of our differences of race. Life is too short.